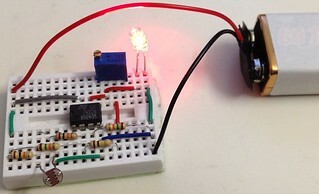 Description: This versatile 741 operational amplifier module can be used for making a dark detector using an LDR, a photo transistor and a photo diode. The amplifier has been configured in inverting mode. 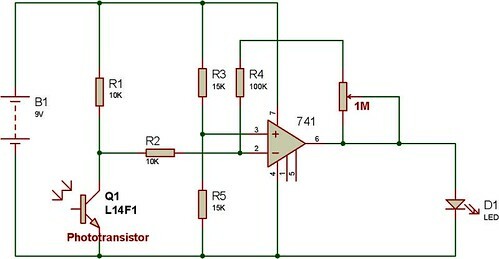 It compares the change in voltage at pin 2 with the reference voltage at pin 3 and gives output at pin 6 accordingly. 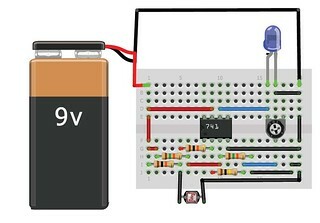 A general calculation and working of similar project has been explained on buildcircuit.com. CLICK HERE for the project. Resistors: 10k (2), 15k (2), 100k (1). LDR (1) or Photodiode (1) or Phototransistor (1). In the following videos, you will see how we can make dark sensors using LDR, phototransistor and photodiode. Once you make the sensor using LDR, you just need to replace the LDR with photodiode and phototransistor. You don’t need to replace or add any other component. unfortunaly it doesn’t work. What could be happened? HI, how can I modify the circuit to obtain a continuos value to measure the light intensity with a micro? THIS PROJECT IS RUN ……………………..